Hungry-Man dinners are well known for providing traditional meals in a quick and easy-to-prepare microwavable package. The company encourages consumers to "Eat Like a Man" and says that they provide "full meals" and "more of the foods guys love." But how healthy are Hungry Man meals? Let's check out the healthiest Hungry-Man dinners. If you choose to include them in your meal plan, we offer a few smart food tips, too. ​If you're a Hungry-Man fan, you probably buy the meals based on your food preferences and not based on nutrition. In fact, finding Hungry-Man nutrition information can be challenging. The company's website does not provide nutrition data and the consumer helpline will only provide information for one meal at a time. This can make it difficult to choose the Hungry Man meal that is best for your diet. The nutrition facts for these Hungry-Man dinners may vary slightly from the meals you see in your store. Different stores carry different selections, so the actual numbers can fluctuate. And according to a spokesperson for the company, Hungry-Man doesn't offer nutrition facts by phone or online because the company changes formulations regularly and that will create changes in nutrition facts. Many of the most popular Hungry-Man meals have calorie counts that won't put them on the "least healthy" or "most healthy" lists. These are the calorie counts for some of the most popular meals. If you include Hungry-Man dinners in your weekly meal plan, there are a few things you should know about the meals' nutrition. If you're scanning the freezer section in your store and need to make a quick choice about the healthiest Hungry-Man meal, choose a selection that is not fried. Meals that are "battered," "beer-battered," or include the words "crispy" or "popcorn" are likely to be fried. You'll notice that many of the least healthy Hungry-Man dinners are made with chicken. Some of the most healthy Hungry Man meals are made with beef. Even though chicken is usually lower in calories than beef, the preparation method makes a big different. Don't buy a frozen chicken meal just because you think it's healthier. Compare labels to get the facts. If you are watching your sugar or salt intake, check the Hungry Man nutrition facts label before you buy. Many of the meals provide more sugar and salt than comparable meals in the freezer case. Some Hungry-Man dinners are made with hydrogenated oil, or trans fat. Health experts recommend that you decrease or completely eliminate trans fat from your diet. If you compare Hungry-Man meals to other meals in the freezer aisle, be sure to take serving size into account. Most Hungry-Man meals are larger. A Lean Cuisine meatloaf meal, for example, weighs about 265 grams. Most Hungry Man meals weigh 450 grams or more. Many Hungry-Man meals include a vegetable and a dessert. This is another meal feature that sets the brand apart from some other frozen meals that provide only the main meat and a side dish. If you buy Hungry-Man or another frozen meal to feel full and satisfied at meal time, you can "volumize" your meal by adding cooked vegetables or a salad. The fiber in fresh vegetables makes the meal feel more satisfying and will help you to feel full longer. 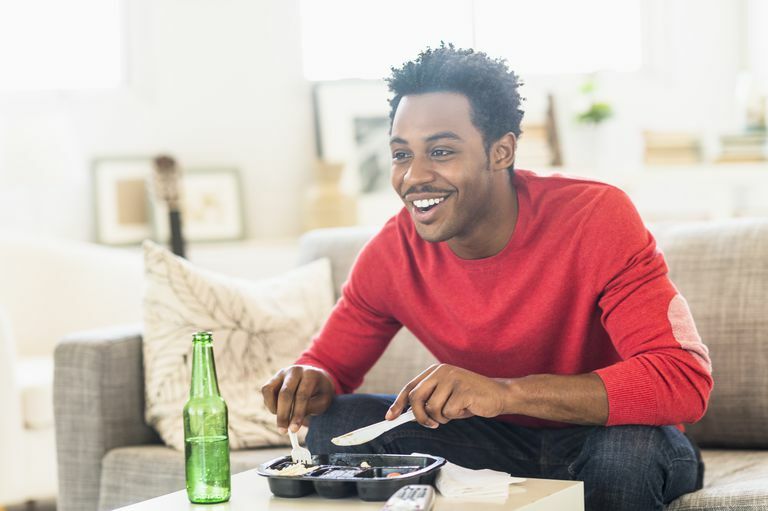 Hungry-Man dinners (or any processed frozen dinners) aren't always the best nutritional choice for improved health and wellness. But if you're a hungry man who is trying to meet his daily fuel needs, you may choose them from time to time. To keep your total nutritional plan on track, try to balance Hungry-Man meals with other dinners that are built around healthy sources of lean protein, fresh fruits and vegetables, and whole grains for optimum health.